March 14, 2002 March has certainly come in like a lion, with strong winds and heavy rains. The weather delayed construction of the ultra-light pilothouse roof, but has not deterred the inner workings of the weather-proof and water-tight Huckins facility. 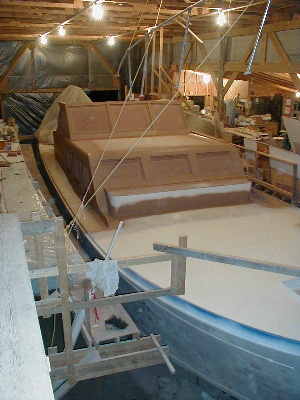 The painting crew, despite the deluge outside, primed and sprayed faring compound on the boat topsides: the foredeck, trunk cabin and pilot house. 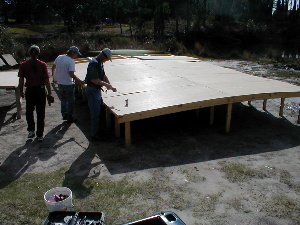 Hot off the presses – as today is dry and calm, the cabin hardtop construction is underway. 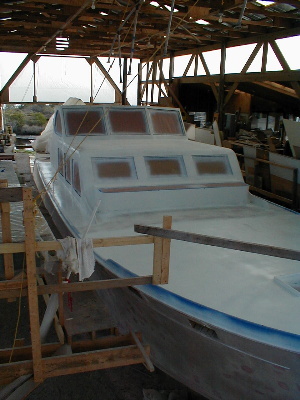 The crew has placed plywood panels on the jig, on which the pilothouse roof will be outlined. 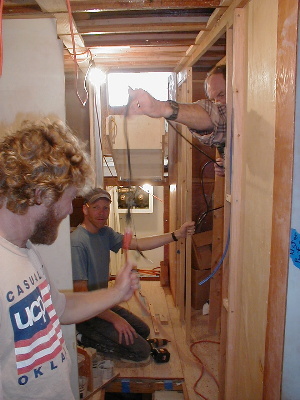 The boat interior is busy as an ant nest, with Steve Gilpin from Offshore Marine installing all the wiring for lights, switches, receptacles, 12 and 24 volt DC, and 110 and 220 AC. 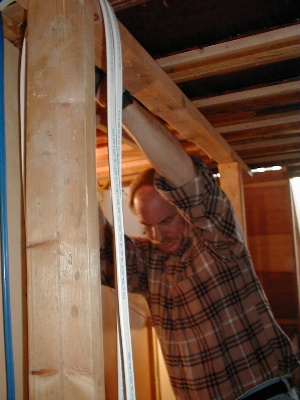 Tom Kirmeyer presses on in the equipment room, installing plumbing and the water pump. Tom Parker is building walls as hard as he can go. Norm continues work on the vanities and drawers. Fish Doc dared climb the ladder and peek beneath the mysterious plastic tent into the engine room to see what’s been going on. 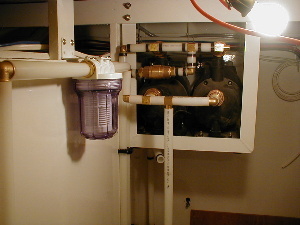 Bill Brown explained that the marine exhaust water-mixing elbow is installed. This device injects water into the exhaust to cool it. Pictured below is the starboard engine. 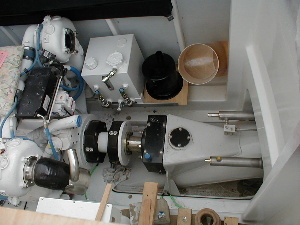 Directly aft and outboard is the hydraulic tank that controls the waterjets, the muffler for the generator and the main exhaust elbow that exits through the transom. One of the water mixing elbows is shown attached to the inboard turbo. As we enter the next stage of the Huckins Project, bossman Bryan Blake has to take care that all work is coordinated and that all components fit precisely and accurately. 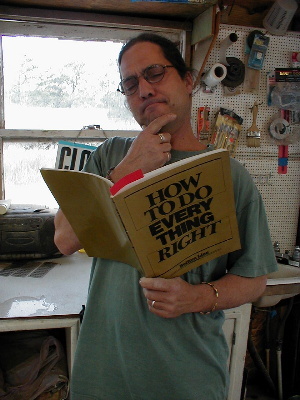 Luckily, he found the perfect guidebook to lead him through the critical last laps of this awesome and unprecedented restoration.